set you can buy them here. These HDMI to Coax adapters allows HDMI audio and video signals to be transmitted using one coaxial cable used with the HDTVECHS10021. This adapter can only to be used with HDTV Supply part number HDTVECHS10021 and will not work as a standalone product. It will not change a coax cable to HDMI or an HDMI connection into coax! The HDTVECHS10021 complete transmitter and receiver set allows you to use the coax wire rather than tearing out your walls to replace them with a long HDMI cable or an HDMI over CAT5 set. The HDTVECHS10021 complete set of HDMI to Coax Adapters lets you extend HDMI audio/video signal by up to 100 meters (328 feet) over single coaxial cable. The extender kit includes both the local transmitter and remote receiver units, ideal for point-to-point digital signage applications that require high quality HDMI video. The extender allows you to run the connection over an existing coaxial cable, with little to no modification required, making it a perfect solution for a broad range of applications. NOTE 1: This HDMI to coax includes either a SEND unit or a RECEIVE unit and an AC adapter and all must be used with either a transmitter or receiver. It cannot work with only one box and needs both boxes. Think of it as 1/2 of a long HDMI cable going to a TV with an HDMI input. Existing passive splitters drop the signal strength in half, or more, so delete all of the splitters and wire directly. It does not work any other way. Our HDMI to Coax Adapter does not convert a coax cable coming out of the wall from a cable box company. Also the connectors are female BNC so if you are using a cable with a male coax connector you will need the optional BNC to F adapters shown in the above options. 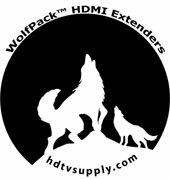 This WolfPack HDMI over Coax uses a single 75 Ohm Coax Cable (RG6 Dual or Quad Shield) to extend the HDTV display up to ~300 feet for 1080p/60Hz. It not only breaks the limitation of the HDMI cable transmission length, but also has more flexibility and convenience in cable construction. It is equipped with HDMI (high definition multimedia interface) connector and is capable of supporting DVI (digital visual interface) equipment when used with an HDMI to DVI Adapter, providing greater flexibility and options when integrating several home theater components. One set includes transmitter and receiver. Using a single coaxial cable (75 ohm) to substitute for an HDMI cable to achieve long range transmission. Auto-adjustment of feedback, equalization and amplify, the user does not need to care about the length of the cable. Each port supports HDMI or DVI inputs (with a DVD to HDMI adapter). NOTE: In-house and existing passive splitters drop the signal strength in half, or more, so delete all of the splitters and wire this device directly. This HDMI to Coax sends only one HDMI signal to a TV. It does not work any other way. Why not buy this WolfPack HDMI to Coax today? HDTV Supply includes a 1 Year Limited U.S. Warranty on this HDMI to Coax. The U.S. warranty states that (a) its products will perform substantially in accordance with the accompanying written materials for a period of 1 year from the date of receipt and (b) that the HDMI to Coax will be free from defects in materials & workmanship under normal use & service for a period of 1 year. In order to get a warranty replacement for a defective item, HDTV Supplys Support Team will verify the product is eligible for warranty. An RMA number will then be issued. Shipped replacements will be in like new conditions, tested and all components included. A 30-day RETURN also comes with this warranty as well as Free Lifetime Tech Support. HDTV Supply also sells a 3 and 5 Year Extended U.S. Warranty for this HDMI to Coax . Please go to Extended Warranties or see the above Options to purchase it. Why not buy this HDMI to Coax today?